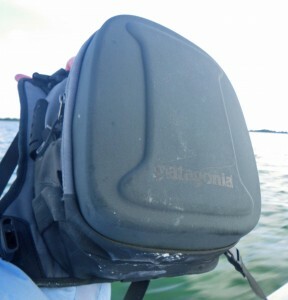 When I went down to Belize in November I got to bring along a new sling pack from Patagonia. The pack isn’t out yet, but it will be in Patagonia’s offerings for 2011, so it should be available soon. The loaner pack, a little battle worn. Previously, I’d used a waist pack to hold all my “stuff” for flats fishing. That had been a good option, but after using the sling pack, I’ll likely be looking to buy one when they become available. Here’s why… the sling pack could be shifted to your back with ease, which kept it out of the way when you didn’t need it. When you need it, just slide it in front and there is all your gear. Because it is higher, you don’t have to worry about drying out all your flies if you happen to wade up to your waist. When down in Mexico in December I was back to my waist pack (I had to send the sling pack back) and routinely I was up to my waist, which meant airing out flies every night. The sling pack solves this issue. There was a fair amount of room in the pack, although the compartment for the fly boxes was just a tad short to hold two of the longer Cliff boxes, which is what I use. Basically, I’m a fan of the pack and I’m a fan of Patagonia, a company that keeps walking the walk (read the interview with Yvon Chouinard, Patagonia founder and Pirate of the Flat and Buccaneer). This entry was posted on Monday, January 10th, 2011 at 1:45 am	and is filed under Gear. You can follow any comments to this entry through the RSS 2.0 feed. You can leave a comment, or trackback from your own site. How would you say this pack would do for fresh water fishing? I think it would be good for freshwater as well. I have a chest pack for fresh water fishing already, which I like. I like having a dedicated freshwater pack and a dedicated salt pack. 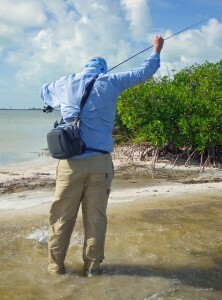 Hey Bjorn, I am looking into geting one of these sling packs for wading. i know you seemed to like it, but I was wondering what kind of space and compartments are in it? I thought there was plenty room… it was a tiny bit short to close on two big Cliff boxes (the long ones and by about a 1/2 inch), but my trout boxes aren’t that long and if you had two of the Crab Shack boxes or two normal size boxes you’d be fine. It isn’t going to carry your lunch or a water bottle, but it has enough space for your boxes, pliers, tippets, leaders, hook sharpeners, etc. I like it. I may buy one. How comfortable was it? It is either between this or a Simms rolltop dry pack for my bonefish wading and stalking snook in the surf. Well, I haven’t fished that lumbar pack, but I have a Fishpond lumbar that is the flats pack I currently own. I think that the sling pack is a bit better, but not having tried the Simms pack, I can’t really say how it compares from a functional standpoint. It certainly is more waterproof, but to get that, you lose ease of access. You also don’t have a drop down shelf to do your tying on, which I kind of like, but that’s a personal preference.